"Molecular matter has not changed in the past 7 billion years"
From radio-astronomical observations of a far distant galaxy we deduce that the proton-to-electron mass ratio � has not changed over cosmic history. Put more precisely, this fundamental constant of nature has changed by less than 10^-7, or less than one hundred thousands of a percent, in the past 7 billion years. The result was obtained from accurate measurement of the frequencies of methanol lines that caused absorption of microwave radiation at several characteristic frequencies. 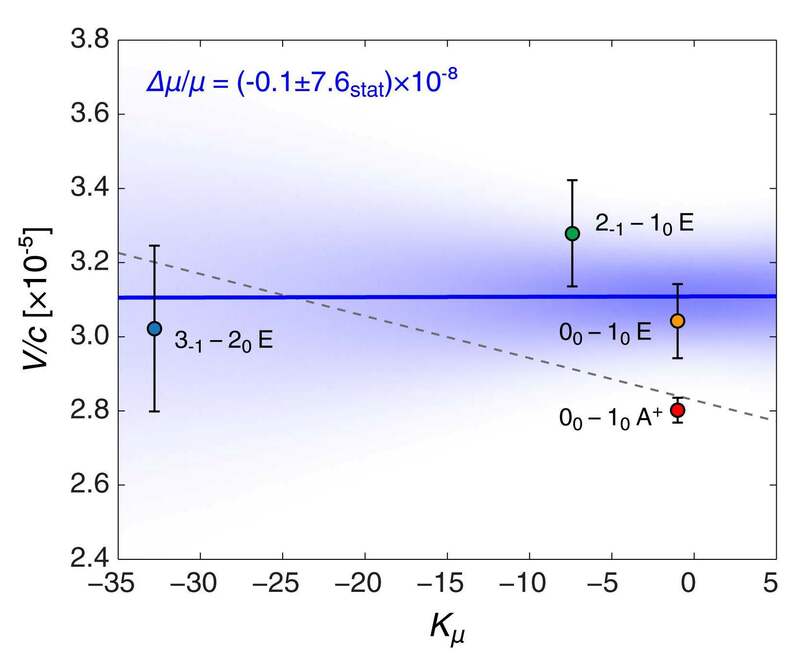 The extragalactic methanol, the simplest form of the family of alcohol molecules, was observed in a galaxy at redshift z=0.89 toward the quasar system PKS1830-211. The stringent limit on the fundamental constant can also be phrased as: molecules and molecular matter is the same now as it was 7 billion years ago. 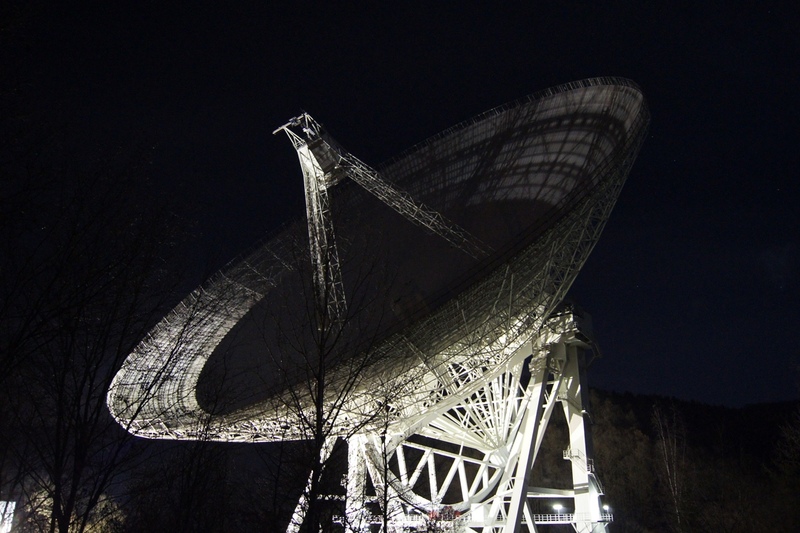 The observations were carried out at the Effelsberg radio telescope by our team consisting of Wim Ubachs (PI), Julija Bagdonaite and Paul Jansen (PhD students) and Rick Bethlem; the work was performed in collaboration with Christian Henkel and Karl Menten of the Max Planck Institute in Bonn (Germany). This work was published online in Science Express on 13 Dec. 2012.
which is hindered, giving rise to quantum tunneling. 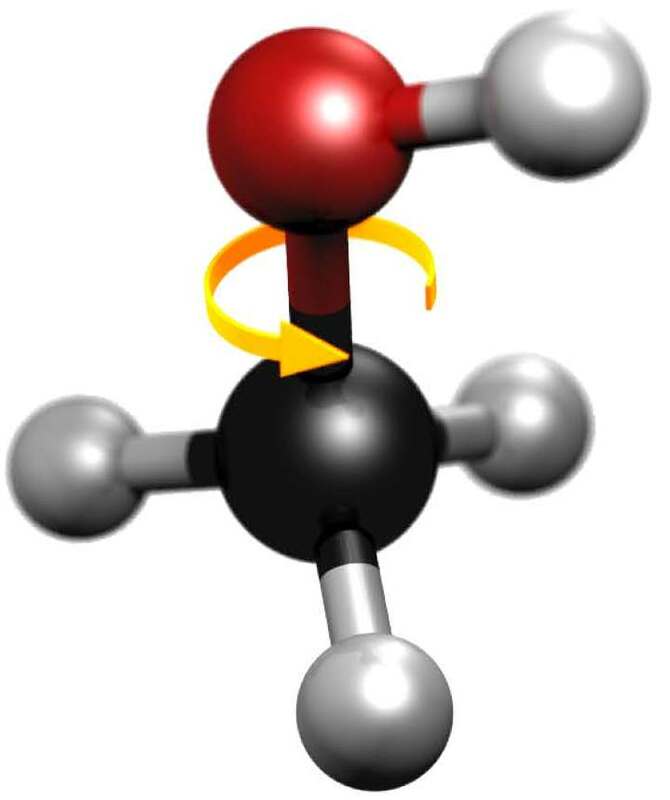 This idea, published in the Methanol paper, makes the methanol molecule an ideal probe to detect a possible temporal variation in the proton-electron mass ratio. For this reason the team proposed to search for methanol molecules in the far-distant universe, to compare the structure of the molecules by the ones observed in the present epoch in laboratory experiments. They performed an investigation of a galaxy known as a "molecular factory" in the line-of-sight of a strong radio source (PKS-1830-211), which is known to be at a distance of 7 billion light years from Earth. The search was for four lines in the radio spectrum of the methanol molecule. 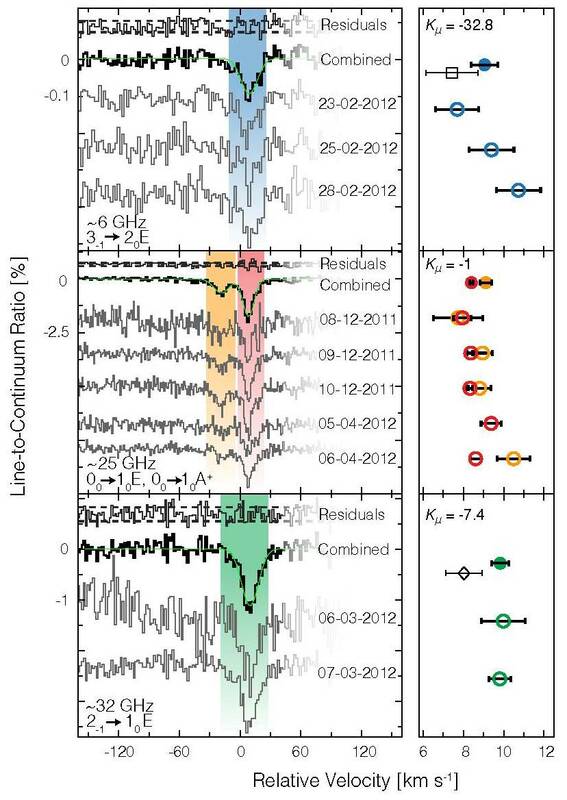 In observations carried out between December 2011 and April 2012 the lines were detected and the spectra are shown below. Note the the absorptions of the radio waves have occurred 7 billion years ago, and the radio waves traveling to Earth carry the fingerprint of the methanol molecules in the distant object to Earth. From an analysis of the quantum level structure of the methanol molecule it can be derived that two of the lines in the spectrum, both observed near 25 GHz, behave like anchor lines; these lines are indicated with red and orange color in the spectrum. Their sensitivity to a drifting � is small; K=-1 for these lines. The other two lines are sensitive to a drifting constant; the green line, observed at 32 GHz has K=-7.4, while the blue line, observed at 6.5 GHz is most sensitive with K=-32.8. Note that the observed frequencies are not the true frequencies at which the radiation was observed; in the mean time (of 7 billion years) the Universe has expanded and therefore all the line have been redshifted by a factor of (1+z), where z=0.88582 for the absorbing galaxy. The relation between the redshift parameter z and the look-back time in the Universe follows from cosmological models on red shift. While the anchor lines determine very accurately the redshift of the absorbing galaxy, the other lines indicate possible changes of the proton-electron mass ratio. Below is shown a plot of the four line positions with respect to a chosen local reference frame (at z=0.88582) where the points are plotted in terms of their Doppler shift (V/c) with respect to this frame; the plot as function of sensitivity factors K reveals an upper limit to a varying �. The statistical outcome is included in the graph. If systematic effects of the observations are included in these data a final result is obtained from the study: the fundamental constant of nature, the proton-electron mass ratio, has changed by less than 10^-7 over the past 7 billion years. This result can be interpreted as: the structure of molecular matter, as probed from its spectrum, is the same as it was 7 billion years ago; it has changed by less than one hundred thousand's of a percent. The research was carried out by four members of the Department of Physics and Astronomy, and of the research institute LaserLaB at VU University, in collaboration with two German colleagues (Henkel and Menten) of the Max Planck Institute for Radio Astronomy at Bonn. Currently the research on radio observations is extended to other radio observatories in the world. 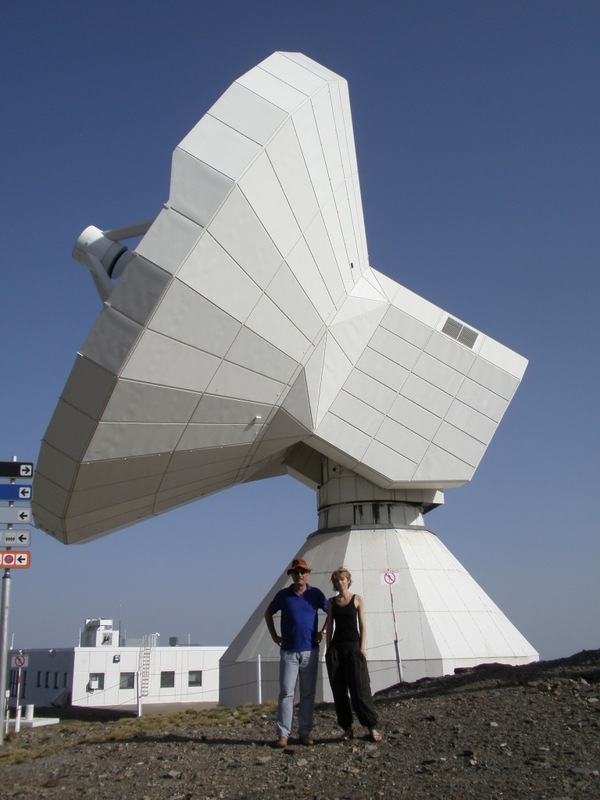 Recently, in summer 2012, observations have been carried out with the IRAM-30 telescope at the Pico Veleta near Granada (Spain). These observations should further verify the present findings and provide even more stringent constraints on possibly drifting constants. Also at Effelsberg extended observations are planned, some of which have been carried out already in Nov. 2012, while more are planned for Jan. 2013. Reference to the publication in Science Express; Free download from Publications Website. Lecture Notes on variation of fundamental constants. Deze pagina wordt momenteel aangepast aan de nieuwe vormgeving van deze site. Is er iets mis met deze pagina, stuur dan alstublieft een e-mail naar de eigenaar van deze pagina.